In 1935 Italy invaded Ethiopia and conquered all the Abissinian lands by May 1936. But it is not well known to most of us that there were agreements to reach peace before the Italian victory. Indeed during the War of Ethiopia there were several attempts to reach a negotiated peace. Pierre Laval, after the secret anti-German agreement with Italy made by Marshal Badoglio and Gen. Gamelin, was a supporter of such a result. In UK there were some circles who followed the same line; their most prominent members were Sir Samuel Hoare, who knew Mussolini very well since the beginning of World War I (he was the British agent who paid the future Duce, then the editor-in-chief of the "Popolo d'Italia" and one of the most important interventist in Italy), Sir Austen Chamberlain (whose wife was in personal contact with the Duce, who always kept a photo of Sir Chamberlain on his desk), Winston Churchill (who had written some articles for the "Popolo d'Italia"). 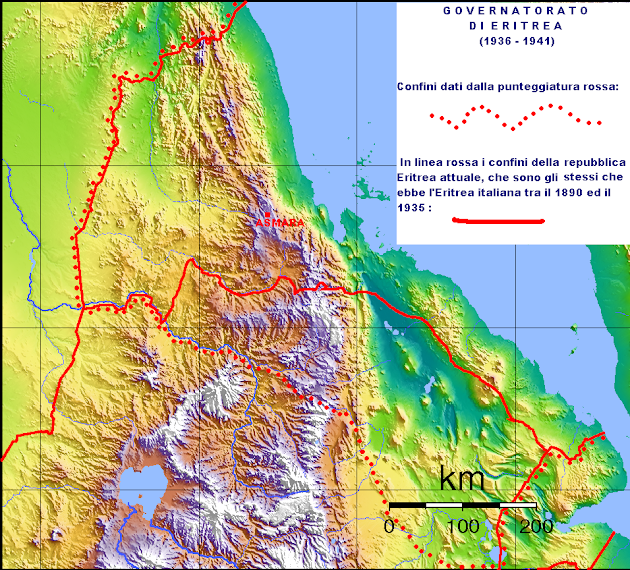 It was in this climate that the "Laval-Hoare Plan" was born; its clauses included some annexions by Italy, the creation of a large area of exclusive Italian economic control in South Ethiopia, in exchange for the opening of a corridor to the sea for Ethiopia, that would have used the port of Assab. 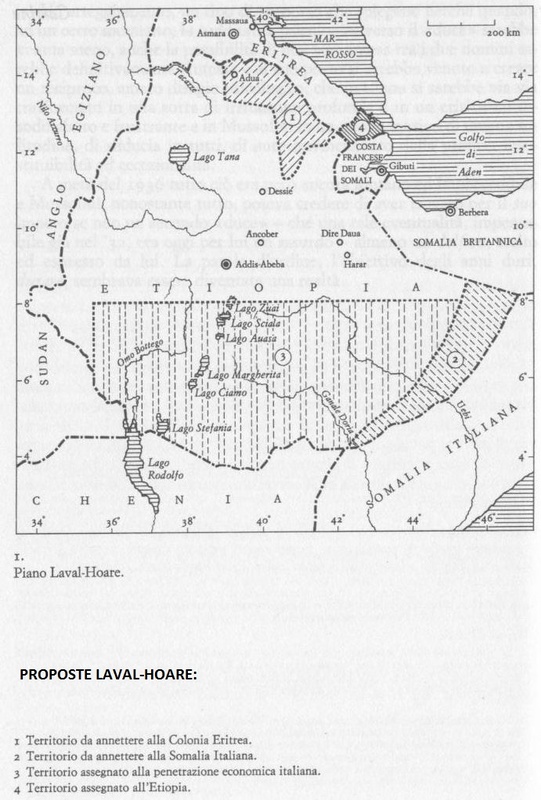 In the Laval-Hoare Plan there were small territorial additions to Italian Eritrea (area numbered 1) and Italian Somalia (area numbered 2). What is more interesting, is that these same clauses were repeated in the secret contract with Chuckry Jacir Bey, a Christian Copt from an important Palestinian family, who was a personal friend of the abuna Cyrillos V (chief of the Ethiopian Church), of ras Mulughietà (Ethiopian Minister of War) and knew the Italian diplomat count Senni. The clauses had even some monetary rewards for the Negus, plus the presence of Italian advisors for his govern and a very interesting "plus": an agreed upon battle, in which the Negus would have been defeated, in order to give him the excuse to accept this agreement in front of his ferocious "ras" (it should be noted that the first thing made by Hailè Selassiè after the Italian attack was to murder his ambitious ras Ligg Yasu). Through Senni, Jacir Bey entered in contact with the SIM (the secret service of the Regio Esercito), led by Gen. Mario Roatta; Roatta ordered Lt.Col. Emilio Faldella to follow the negotiations. On 11 Dec. 1935 Faldella, Senni and the Consul of the MVSN Vezio Lucchini signed a contract that was almost a perfect copy of the "Laval-Hoare Plan"; Jacir Bey, in order to get his reward, had to persuade the Negus to accept this offer. If he had failed, he should have kidnapped him using his airplane. It should be noted that the "Laval-Hoare Plan" was indeed written mostly by Laval during his phone conversations with Mussolini himself. It failed because the British anti-Italian circles, led by Anthony Eden, had a very subtile idea: they leaked its text to the press, which started a violent campaign against what was, pratically, a reward for the Italian attacker. For this reason, on 18 Dec. 1935 Hoare was forced to leave the British Govern. Meanwhile, the mission by Jacir Bey failed: Hailè Selassiè, at first, hoped to win the war or, at least, to stop the Italians as long as possible so that the League of Nations would have extended the embargo also to the extremely important oil and fuel. The Negus hopes were frustrated on the battlefield and in the diplomatic circles; these latter ones were very alarmed by Hitler's occupation of Rhineland on 7 March 1936 and, expecially in the French govern (but not in the press), appeasement with Italy was as strong as ever. 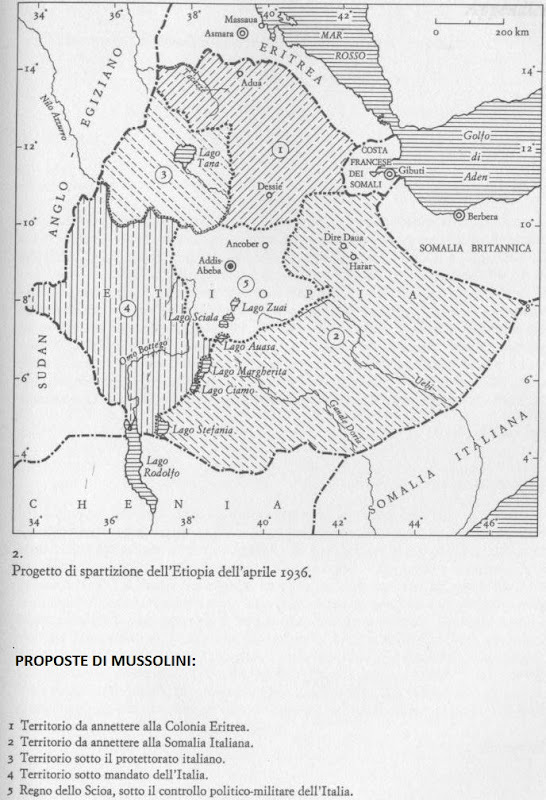 However at the beginning of April 1936, when the Italian victory was very near, Mussolini decided to make a last offer: Italy would have annexed Northern and South Eastern Ethiopia, with the rest under its protectorate or under the League of Nations mandate or nominally independent. 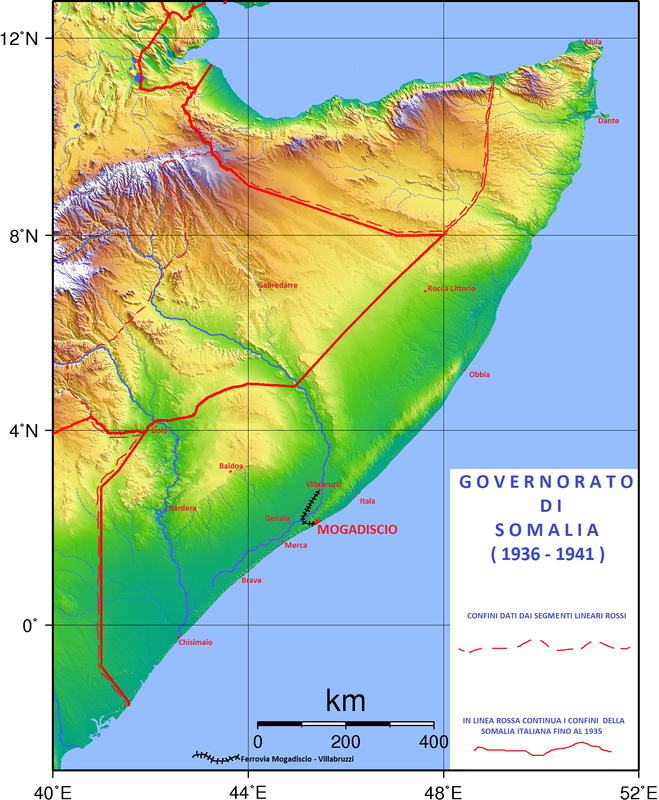 In Mussolini's Plan Italian Eritrea was going to be enlarged with the Tigre region (area numbered 1 in the map), while Italian Somalia was going to be increased with the full Ogaden plus areas around Harar-Dire Daua (area numbered 2). This plan failed anyway, because of the British opposition, this time followed also by the new French govern, led by the leftist Léon Blum, enemy of Fascism despite the common opposition to Germany's rearmament and expansionism towards Austria. It should be noted that the Jacir Bey affair was kept as secret as possible and was discovered only during the "Roatta trial" of the end of 1944; the documents regarding it have been partially stolen both from the Tribunal of Perugia (that reviewed the case in 1949) and from the personal archive of Gaetano Salvemini, the antifascit historian who, first, studied this case. Some -like Indro Montanelli- questioned why Mussolini proposed his Plan when he had clearly won the war against the Negus, but the answer can be probably found in his contacts & correspondence with Churchill: he was trying to maintain his links with the British, while hoping to stay away from the dangerous hands of Hitler. It is noteworthy to remember that after his conquest of Ethiopia, Mussolini embraced Hitler but at the same time he ordered the construction in the Italian-Austrian border of the "Vallo Alpino" (a powerful defensive system -like a "Maginot"- in the Alps) against the possible Hitler invasion of Italy.